In loving memory of / Ernest. 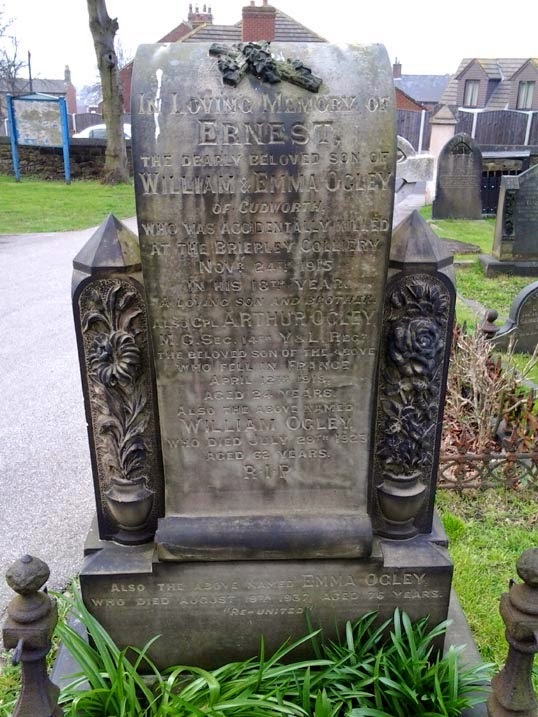 / The dearly beloved son of / William & Emma Ogley / of Cudworth / who was accidentally killed / at the Brierley Colliery / Novr. 24th 1915 / in his 18th year / a loving son and brother / also Cpl. Arthur Ogley / M.G. Sec. 14th Y & L Regt. / the beloved son of the above / who fell in France / April 12th 1918 / aged 24 years / also the above named / William Ogley / who died July 29th 1923 / aged 62 years / R.I.P. / also the above named Emma Ogley / who died August 19th 1937 aged 76 years / "Re-united"